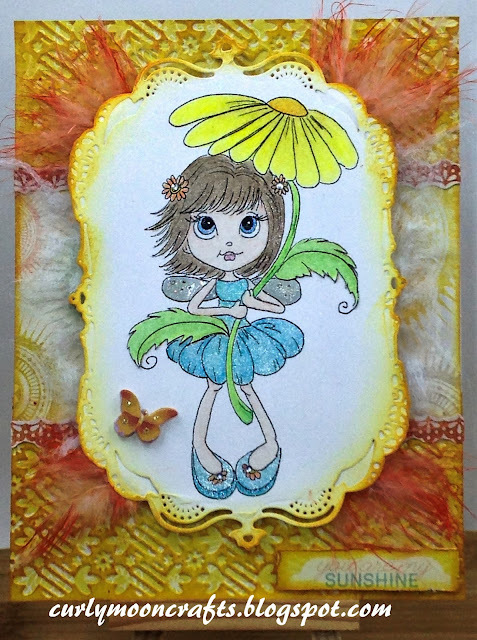 My creation for this week is a card using the Charlie's Flower image. See images, design process, and supplies used, below. I printed the digi image onto PRISM white cardstock and colored her with Prismacolor pencils and gamsol. 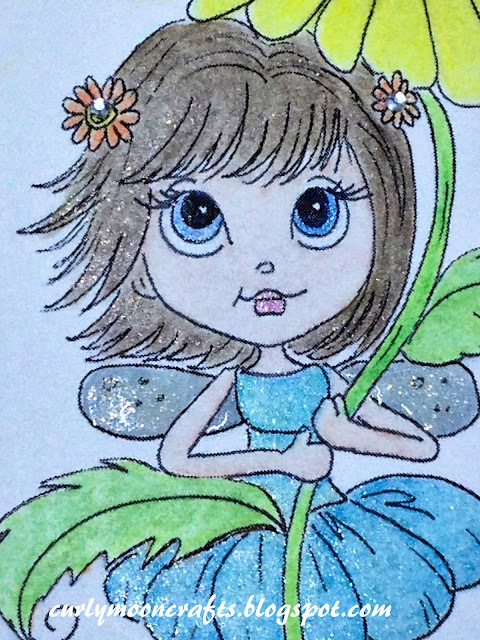 To add a bit of fairy dust, I added some shimmer to the flower, her hair, shoes, and dress using my clear Wink of Stella pen, then used Glossy Accents and glitter on her wings. I added gemstones to the center of the flowers. I cut the image out using a Nestabilities die, colored the edges with Distress Wild Honey, then backed her with fun foam. I covered a 5 X 6.5 card base with MME - Tangerine papers - the top/bottom portions of paper were embossed with a floral embossing folder, then inked with Wild Honey to enhance the raised portions. The edges were inked with Wild Honey. I fussy cut a border for each side of the middle section and glued it to the card front, then added the image panel to the center. I cut and distress the sunshine sentiment from the MME papers, then added them to the bottom of the card using foam dots. I added a small layered butterfly to the bottom corner of the image. To finish of the ethereal fairy effect, I added some feathers colored with Distress Ripe Persimmon ink, and some more of my favorite recycled dryer sheets.